But sadly, for many, their potential is seriously limited by stress which can block creativity, inspiration, or worst of all, cause individuals to doubt their true talents. While companies have tackled these obstacles with a variety of stressmanagement programs, but not all of them are as effective as meditation. 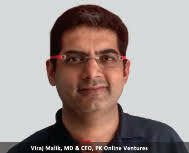 A digital media company – PK Online Ventures is one of the few who have incorporated such culture of meditation via their ‘Power Within’ program in their organization, contributing to a happier and healthier working experience for employees. This program not only endeavors to empower the inner self and creativity of the employees but also increases their capacity to deal with challenges.